The GWSP primarily focuses on advancing knowledge and building capacity. It supports client governments to achieve the water-related SDGs through the generation of innovative global knowledge and the provision of country-level support, while leveraging World Bank Group financial instruments and promoting global dialogue and advocacy with key partners and clients to increase reach and impact. This Partnership will provide new opportunities to test and scale-up innovations, build country capacity where needed and influence client demand and World Bank operations. 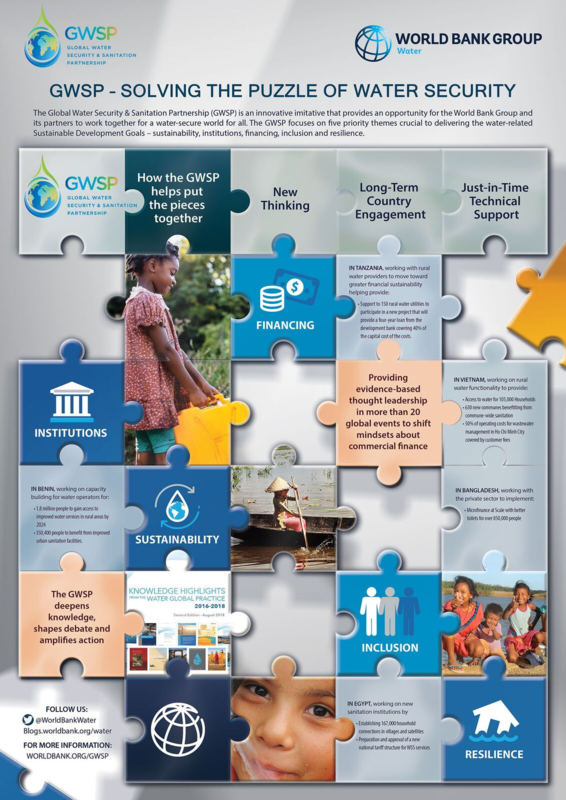 Learn more about GWSP in this brochure. Check out the 2018 Cartoon Calendar. Sustainability is ultimately about ensuring that available resources today can continue to deliver benefits to future generations. The partnership focuses on two critical aspects for ensuring long-term sustainability of water investments. Firstly, the sustainable management of water resources. This means securing the long-term availability of water resources, considering the impacts of population growth, rapid urbanization and climate change. Secondly, infrastructure assets should be adequately built and maintained, to ensure for example that handpumps do not break down prematurely or that treatment plants are not abandoned for lack of adequate maintenance. Inclusion is the process of improving the terms for individuals and groups who are disadvantaged based on their identity, to take part in society. Water belongs to everyone and yet many are excluded from its benefits and often from ownership and control of this critical resource. Ensuring that a project is inclusive enhances the inclusion agenda requires better knowledge on the nature of water inequality, enhancing capacity and putting in place incentives that will result in better outcomes. Underlying such design also requires strong institutions that will hold state and service providers accountable. Expanding access to and improving the quality of services can only be achieved and sustained if the institutional arrangements provide the right incentives and resources and the organizations tasked with service delivery also have the requisite capacity. Institutions comprise the formal and informal rules of the game within which these organizations operate and, through them, impact the quality and sustainability of services. To the extent that providers of Water, Sanitation and Hygiene (WASH) and irrigation services are (quasi) government entities, they are influenced by the broader governance environment and the institutional architecture of the public sector that goes beyond the water sector. To strengthen institutions and accountability for service provision, GWSP works to understand the rules of the game and incentive structures, grounded in local cultures, economies, and political circumstances. Management of water resources and water facilities will increasingly be subject to shocks in years to come. That’s because climate change is predicted to increase climate variability and extreme weather events, such as floods and droughts. Resilient solutions call for strategies and tools at the country, basin, and project level capable of incorporating not only climate and disaster risk consideration into the analysis, but also innovative solutions to ease water scarcity constraints as well as socioeconomic and environmental considerations. Building climate resilience will require developing tools and approaches that can help save lives and livelihoods. Resilient water services (water and sanitation, irrigation, etc.) are better able to adapt to shocks and stresses and continue delivering essential services to the population. Of course, these themes do not exist in isolation and need to be rolled out simultaneously so that actions under each of these themes can mutually reinforce each other and can contribute to the many other SDGs with which they are so closely interlinked. The GWSP primarily focuses on advancing knowledge and building capacity. It supports client governments to achieve the water-related SDGs through the generation of innovative global knowledge and the provision of country-level support. It leverages World Bank Group financial instruments and promotes global dialogue and advocacy with key partners and clients to increase reach and impact. This Partnership provides new opportunities to test and expand innovations, builds country capacity and informs client country demand and World Bank operations. The GWSP is a ‘living laboratory’ which provides countries with guidance, policymakers with knowledge and learning products, and the public with resources about why water is so crucial to the world’s wellbeing. The GSWP, hosted by the World Bank’s Water Global Practice (Water GP), offers many years of experience from the ground, some of the world’s foremost water experts and the ability to convene a wide range of diverse actors. At the core of GWSP’s model is a belief that first-rate research and systematic knowledge is essential to maintaining the high quality of World Bank operations. It is equally essential to shaping the external debate as part of our mission to deliver a water-secure world for all. So the GWSP produces strategic, robust and practical information, insights and ideas to shape both practice and policy. This book presents new evidence to advance our understanding of how rainfall shocks, coupled with water scarcity, affect farms, firms, and families. A key message is that water has multiple economic attributes that entail distinct policy responses at each stage in its cycle of use. If water is not managed more prudently— from source, to tap, and back to source—the crises observed today will become the catastrophes of tomorrow. The impacts of climate change will be channeled primarily through the water cycle, with consequences that could be large and uneven across the globe. Water-related climate risks cascade through food, energy, urban, and environmental systems. Growing populations, rising incomes, and expanding cities will converge upon a world where the demand for water rises exponentially, while supply becomes more erratic and uncertain. They will jeopardize growth prospects in the regions worst affected and in some of the poorest countries. This discussion paper provides an overview of the poverty-related impacts of inadequate water supply and sanitation and highlights the policy challenges that have emerged in a more populated, polluted, and urbanized world with finite water resources. It highlights the need for sustained changes in individual behavior, more equitable access to services, and incentives for improved water resource stewardship. The World Bank’s water portfolio currently covers 175 projects worth US$27 billion in lending and technical expertise. In the "Project of the Month" series, we feature the results achieved by these projects and showcase how the World Bank works with countries to address challenges and deliver solutions on the ground. Under the auspices of Global Water Security and Sanitation Partnership (GWSP), the Water Cartoon Calendar has carried on the tradition of raising awareness around critical global water issues through humor. Citywide Inclusive Sanitation means that everybody benefits from adequate sanitation, with human waste being safely managed at every point along the service chain. The cities show-cased in these videos each demonstrate experiences that have embraced such approaches to ensuring the poor are provided with sanitation services. Water Supply and Sanitation utilities work together, or “aggregate”, when multiple municipalities unite under a single administrative structure. The World Bank’s Water Global Practice launched a toolkit and background report which explore why, when and how water utilities can work together to provide better services. The report looks at how the increasing number of droughts and floods impact farms, firms, and families in ways that are far costlier and longer lasting than known before. As part of High Level Panel on Water (HLPW)’s campaign for valuing water, the video was shown to a few heads of state at the UN General Assembly 2017 in New York, calling for a fundamental shift in the way the world looks at water. The report draws on regional and global examples to show that limited water resources need not restrict the region’s future, but that a combination of technology, policy and management can convert scarcity into security. The report shows how water often reflects, and even reinforces, gender inequality examining how norms and practices related to water often exacerbate ingrained gender and other hierarchies. This initiative – which encompasses 18 countries ranging from fragile and conflict-affected states to middle-income countries – undertook multidisciplinary research and developed in­novative methods to fully appreciate the impacts of inadequate services on human development outcomes and identify the binding constraints to service delivery. World Water Week in Stockholm is the annual focal point for the globe’s water issues. People from around the world come to Stockholm to network, exchange ideas, foster new thinking, and develop solutions to the most pressing water-related challenges of today. The World Bank Group has convened and participated in over 30 sessions of 2017 World Water Week. As part of the Thirsty Energy Initiative to incorporate water constraints into its energy-planning model and foster a more sustainable system, the report “Modeling the Water–Energy Nexus: How Do Water Constraints Affect Energy Planning in South Africa?” finds that accounting for the regional vari­ability of water supply (and the associated costs of water supply infrastructure) can significantly impact energy planning, especially in a water-scarce country like South Africa. Water scarce cities around the world, in both high income and developing countries, are undertaking a paradigm shift in how policy, technology, and management systems are applied to improve financial and ecological sustainability and social equity. The Water Scarce Cities (WSC) Initiative brings together practitioners to learn from each other and accelerate the adoption of this new paradigm in all of the water stressed regions of the world. The 2017 SWA High-level Meetings (HLMs), which took place in Washington D.C. on 20 April during World Bank-IMF Spring Meetings, included a Finance Ministers’ Meeting (FMM) convened by the World Bank on behalf of the SWA partnership, and a Sector Ministers’ Meeting convened by UNICEF, including ministers responsible for water, sanitation, and hygiene. Countries and partners discussed national plans to meet the challenges of the water, sanitation and hygiene-related SDG targets and required resources. The report finds that when water insecurity repeatedly affects populations, it can act as a risk multiplier, fueling the perception that institutions and governments are ‘not doing enough’, exacerbating existing grievances, creating new risks, and deepening inequities. In turn, this contributes to destabilizing already fragile contexts, aggravating the challenges of water management, and perpetuating a vicious cycle of water insecurity and fragility. The report finds that many water utilities in Africa are working hard to expand access, but most haven’t kept up with the growing demand or the maintenance on aging infrastructure. This has left only one third of urban residents with piped water to their homes. Increasing access to a safe water supply will require more investment in utility infrastructure, while improving the capacity to operate and maintain services. Even though solar water pumping is ready for mainstreaming and has started to take off in some parts of the world, its benefits remain largely unknown to communities, governments, and development institutions. To address this knowledge gap, the World Bank has developed an accessible and interactive Knowledge Base on Solar Water Pumping, aiming to raise awareness about the technology and provide resources that help incorporate it into operations. The GWSP supports client governments to achieve the water-related Sustainable Development Goals through the generation of innovative global knowledge and the provision of country-level support.